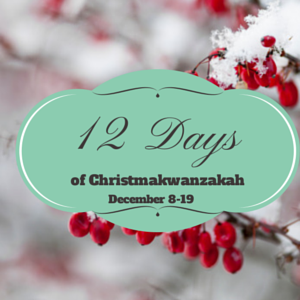 Thanks for stopping by during the 12 Days of Christmakwanzakah! I’m so excited to be participating with all the other wonderful authors. Many thanks to Julia Kelly and Alyssa Cole for organizing. I hope you enjoy Max and Sophie. This was the third time the flight attendant had apologized. The impeccably made-up woman’s face crumpled into helpless chagrin and Sophie almost laughed. Sophie’s mouth drew together in a pained smile and she nodded. Yes, he is. Cute was not a strong enough word for 21B. When he’d sat down, she’d almost died. He was tall enough to be uncomfortable in coach seats; his knees wedged into the folded-up tray in front of him, his broad shoulders encroached on her space over the armrest. She hadn’t minded, really. Especially when he’d sheepishly apologized. As if there was anything he could do. But she’d appreciated the gesture, the acknowledgement. And his face. Blue eyes like she could barely believe and dirty blond same-length scruff that covered his jaw and scalp. Usually she preferred more hair, enough to sink her fingers into, but she’d make allowances for 21B and the broad, strong planes of his cheeks and forehead. His head was resting heavy on her shoulder, his breath blowing warm across her collarbone as he slumbered. He’d been asleep for most of the flight, restless for the first hour. He’d startle awake when he dipped into the aisle, drag himself back, then repeat the same slow slide. Eventually he’d shifted and leaned on her, the weight of his head forcing her to just, for the love of god, sit back and relax. And what the hell was that smell? Like salt-dusted pitch pines, the ones that managed to flourish in the sandy soil of the Cape. She’d been glad to get the post-doc position at Woods Hole, running away from the family that wouldn’t leave her alone. She inhaled, feeling guilty for her olfactory voyeurism. But it was his fault, wasn’t it? For falling asleep on her? She nodded, not wanting to risk speech. He dropped a nod and she avoided eye contact, keeping surreptitious tabs on his broad back until he melted into the crowd at baggage claim. Farewell, 21B. At her aunt’s house she unpacked; hung clothes, arranged toiletries. She’d tried to beg off and stay at a hotel, but her aunt wouldn’t hear of it. So she was stuck at the house in the French Quarter, surrounded by overbearing relatives. She already wanted to escape. When she reached into the side pocket of her bag, there was a folded piece of paper. Probably an old receipt or plane ticket, but she opened it to make sure before she tossed it. You smell pretty good yourself. I’ll be in New Orleans for a week before heading home to Boston. I’d like to take you out for coffee. Or a drink. Or a beignet. Pick your poison. And there was his number. Her face flamed—He’d heard her!— but her mortification settled into a low burn of pleasure. Sophie stood at the corner of Jackson Square where she was supposed to meet Max. She’d debated calling him, but after a day spent stuffing mirlitons and batting away questions about when she was moving back home, she’d wanted to escape to the anonymity of the caroling crowds. Once she’d gotten here, though, she’d wanted recognition. Someone to know her name, even if he thought her name was 21A. She’d rather be 21A than the morose Sophie her family expected. Even after a year, they couldn’t stop giving her sympathetic looks. Yes, she was fine. Yes, she liked her job. And yes, it had been the right decision to break off her engagement because Darren hadn’t been the one. Or as he’d told her, she hadn’t been the one for him. Too quiet, too involved in her work. Why can’t you loosen up and have some fun? So she’d called, not daring to expect Max would be free. Almost hoping he wouldn’t answer so she could hang up after listening to his voicemail message. But he’d picked up, seemed pleasantly surprised when she identified herself. And here he was, making his way through the crowd. Half tourists, half locals, all red-faced with holiday cheer and Bourbon Street brews. He navigated around them, his body big but nimble. He smiled when he saw her and she ducked her head. She’d become unused to people looking that happy to see her. She shoved her hands in her pockets as he approached. What had she been thinking, meeting a stranger? But the sing was about as public as you could get. “Max.” She blushed when she said his name, loved the way his grin got wider. “How’s your stay so far?” He wasn’t from around here. The way he spoke was the crisp sounds and aggressive punctuation of the North. She’d gotten used to it over the past several months; liked the driven cadence of it. A welcome change from the slow, sinuous drawl of Louisiana. He reached out and tugged the thick-knit yarn back up, letting his hand linger on her arm a beat too long. Cold. Distant. That’s what Darren had said. She bit her lip, not knowing how to respond. Next thing he’d be telling her, Smile. You’d look prettier if you’d smile. The tourists, a lot of them came for the food, the music, the booze. They’d find it. The brassy bluster of thoroughly-spiced Cajun food and the jazz bands were hard to miss. But some of them sought something deeper, the magic particular to New Orleans. She loved the unapologetic music of Christmas. With so many people, she could sing to her heart’s content and not worry if anyone could hear her, if anyone would judge. It wasn’t cool, but she liked it and hoped he wouldn’t say no. She gestured for him to follow her into the crowd and all the warmth in her body gathered where he rested his hand on her back. She was so used to being dragged around by Darren that being followed—especially by this hulk of a man—was heady. Sophie threaded her way through the close-packed people and found a spot where the crowd was less dense. With Max at her back, people gave her space and she liked the vague heat of him. Protective but not smothering, like he wanted to burn with her, not add her flame to his own. She expected him to stand alongside her, but he stayed behind her. The corner of her mouth turned up as he started to sing. His voice was like him. Big, but not overshadowing and when she inched against him, she could feel the vibration of his true notes. They sang for a while and the tension bled out of her, got carried away on the tones of her neighbors. This wasn’t technically getting to know Max, but anyone willing to sing carols with a square full of strangers couldn’t be all bad. Her eyes watered like they always did during O Holy Night and when they finished, she swiped the tears away. The scent of him hit her as she turned and it made her wistful for the place she’d called home for only a few months. Maybe next year she’d have a New England Christmas instead of a New Orleans one. “I don’t suppose you’re hungry?” She’d stolen bites while helping out in the kitchen, but the shrimp and squash seemed to have been consumed by the singing, maybe by the banked fire of Max. They chatted over the ceramic plates and cups while their knees crowded under the wrought iron table. She threaded a thigh between Max’s denim-clad legs so instead of bumping against each other, they were nestled comfortably. He worked for a shipping company, and when a last-minute emergency came up he’d drawn the short straw. A down payment on a family. It was stupid—they’d just met—but she liked the portrait the single sentence painted. Solid, responsible, generous. Sophie put her hand in his when he offered it and held on as they strolled the brightly-lit streets. She considered meandering down more streets than strictly necessary to get back to her aunt’s house, but on the off-chance he had a perfect sense of direction she didn’t dare. They arrived at the house too soon and she didn’t want to let go. But the noise of her boisterous family leaked from around the shutters and under the wreath-bedecked door. “Yeah?” He hadn’t gone anywhere, was maybe waiting for her to get inside before he headed back to his hotel. The thought pleased her enough that she mustered the courage to lean in and kiss his rough cheek. He caught her with gentle fingers that slid through the hair at the nape of her neck and tugged her in for the possibility of a kiss. She met him halfway. His mouth was soft, encouraging, and she let their lips touch for longer than was probably wise, her fingers wrapping around the lapels of his coat. You smell like cinnamon and cloved oranges. Merry Christmas, Sophie. Maybe next year would be better than the last. Thank you for reading A Thrill of Hope! I made a little mini pinterest board if you like that kind of thing. Today’s other story is by K. M. Jackson, and you can find the rest of the schedule here. Best wishes for a happy holiday season!